247meeting Mobile enables you to transfer or monitor your deskphone conference call from your smartphone, just like a remote control. You can start a conference call on your deskphone and continue on your smartphone, without interruption. Just open the 247meeting Mobile App, log in and the app will automatically recognise your call and connect you. You can then hang up your deskphone. As the Host of the meeting, you can either join the call in due time and wait for your Guests alone in an empty meeting room or you can join only when all your guests are connected. 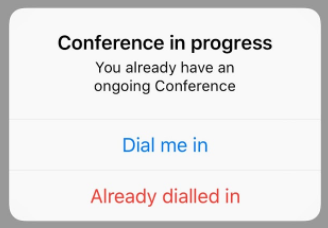 When opening the app, click on “Already dialled in” to view your Guests entering the call, or click “Dial me in” when you’re ready to join your attendees and start the call effectively. When on your conference call, just click on the + sign on the upper right corner of the app. Then, pick the person in your contact list and add them to the call by clicking "Done" in the upper left corner.